Had a comment from one or two who would not move off Sage because they rely on the cash-flow forecasting reports. Any plans to add this feature to Quickfile? It’s not something on our short to mid term agenda, although that could change if we get more support. I see this was suggested back in May, but no comments or votes since. In the interest of confining feature discussions to one thread I will close this but recommend you add your vote over there. Firstly, I would like to say Quickfile is a great help, and you guys are doing a great job of it. I am a new user of quickfile and was wondering if anything continued with the request of having a cashflow forcast report. I have come across the FAQ topic, but the topic had closed. It would be great if it could have a criteria (last year/s comparison to the current and the future). If not much has continued with it, then any chance it linking to a 3rd party that could work through API. @abuhudhayfah I’ve moved your post over to this thread to keep everything in one place. Unfortunately it’s still not something on our short to mid term agenda. Your vote has been acknowledged though. We too are looking for a way to use Quickfile for our forecasting. If you could register our vote towards it too please? I’m not familiar with the Sage forecasting mentioned below, but most definitely need forecasting charts to be available. In Microsoft Money this was/still is a main feature of the dashboard and I have to say I use this for domestic affairs - it’s invaluable to help manage cashflow, investment timing and so forth. Cashflow scenarios might be asking too much as well? Otherwise thanks for the superb tools so far. This is something I’d be very interested in! I echo this, a cash flow forecast report would be incredible for us as well. +1 … I’ve just started using Quickfile for a non-profit organisation, and it’s really amazing out of the box - but being able to show a budget/cashflow against future expenses (estimates and/or recurring) would be a killer feature. I couldn’t agree more with the need for a cashflow management/budgeting solution. Cash flow is the heartbeat of your company. If cash flow is good, then no matter how badly run or poorly managed a company is, there is always a decent chance of turning its fortunes around. You can delegate many tasks when creating a new business, but monitoring and forecasting cash flow is not one of them. It’s your responsibility and your task. But the need to use a separate piece of software for the crucial part of my job adds unnecessary hassle. 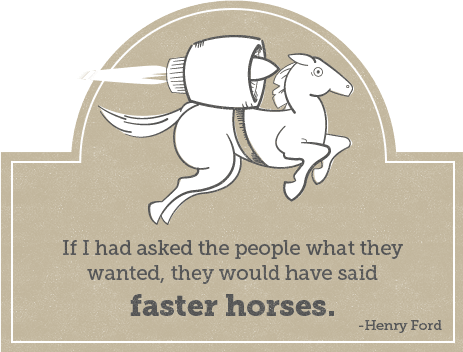 @Glenn, following in the footsteps of Henry Ford, why not take the lead and proactively tell the customers what they need — even if they’re not yet aware of it? There seems to be quite a bit of variability in terms of how cash flow reporting is done, this makes it difficult to come up with a “one size fits all” solution here. I noticed many accounting software applications leave this to other 3rd party apps like floatapp.com. We’re not averse to developing a native solution for cash flow forecasting, but it would be good first to have a dialogue about how exactly QF users would expect the business logic to work. I looked at previous comments then one thing to clear up would be the nomenclature. A cashflow forecast is not the same as the cashflow statemet that one poster referred too although both would be good to have. The cashflow statement would be a period end report that reconciles the company profit to the closing bank balances for a period. I use it with medium to larger companies to give structure to explaining where the money has gone. The cashfow forecast, on the other hand is designed to try and predict working capital requirements. 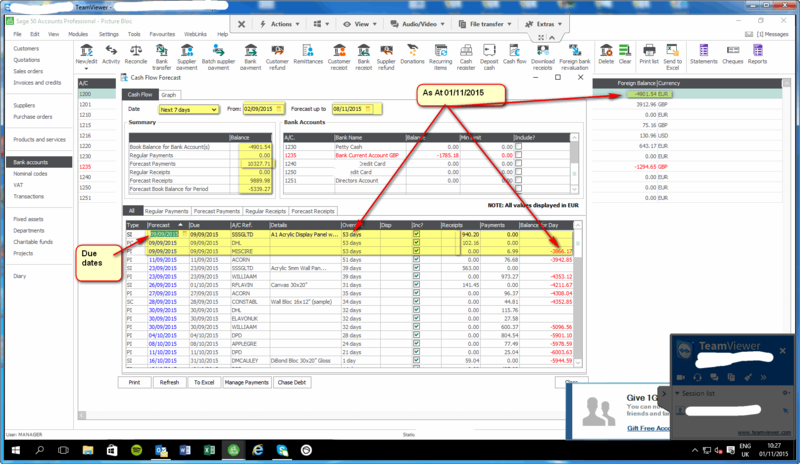 I have Sage 50 clients who will not move to Quickfile because they depend on the built- in cashflow forecasting features of that software. I’m not familiar with Floatapp other than the fact that they seem charge £25 per month. Not sure if that’s per client. The logic behind the Sage 50 forecast tool is driven mostly by the due dates on sales and purchase invoices being added to a current bank balance. There is a separate tab where you can make entries for scheduled regular payments/receipts to add to those drawn from the sales and purchases sub-ledger. That, for instance, is where you would add in payments for wages, PAYE and other non-sub-ledger items in order for them to be taken into account. A forecast position remains open whilst the items that make up that position remain unpaid. Such items are continually stressed against the relevant bank account balance. The system can therefore display both how overdue a cash position is and the aggregated cash needed to clear all overdue positions at any given time. I attach a redacted screen shot from a live Sage50 system for illustration. From the attached we can see that the client would need an additional €2078 in the bank to clear down all overdue payments assuming all overdue receivables can be collected in. The information needed to add a cashflow forecast option to Quickfile is already entered. The only change to users would need to be to making sure the payment terms they have set up on the system are the real ones in force in the business. One level of sophistication is that you can generate separate forecasts for each bank account. Doubt the need for that at this stage. @Glenn, I agree with @Adrian_Maudsley: it’s not about reporting (backward-looking) but rather with forecasting and active management (forward-looking). Prioritze available cash to pay for current and anticipated expenses. Anticipate larger, infrequent expenses and save for them rather than be surprised. Change the plan in light of new circumstances. In any case, I want to reiterate the point made by @Adrian_Maudsley that it needs to be forward-looking. Take all sales invoices that have been raised and tally the amounts by week (to allow for variability). Ditto projected expenses per broad, user-defined categories. To me the key is not to overdo it. Don’t create a complicated, overly sophisticated monster. There’s already too much of that on the market. The data is noisy and not precise, so we mustn’t optimize within noise: it’s better to be about right than exactly wrong. @Glenn, if you need more input, I’m ready to share my thoughts. @Adrian_Maudsley @marekkowalczyk Thank you for your input. Developing a simple cash flow forecast wouldn’t be a huge feat for us providing we had clarity on what the end result should look like (some progress made already here!). The challenge is always translating the business logic into something a programmer can reproduce in code. In order to achieve cash flow forecasting for specific bank accounts, presumably QF would need to know eventually where any open invoices will be paid to/frrom? Currently we don’t store this information. For situations where you have multiple invoices in different currencies would you expect them to appear together in the list and then sumarised by currency in a totals box? That seems to be how Sage handle this. What about recurring sales invoices and purchases? Presumably you’d want these included? Book Balance for bank accounts - Is that an aggregate balance of all bank accounts (1200-1299)? 4 - No, in sage there is a separate forecasting facility so the book balance, in the screen capture given, was just for that account. Might need summarising position across all accounts to a dashboard widget. Glen, the business logic is much simpler than you think . To me the purpose of the functionality is NOT to be ‘accurate’ within noise but to have the confidence that I have enough cash to safely make commitments. Absolutely no need to have cash flow forecasting by specific bank account. That’s adding unnecessary sophistication. For invoices in multiple currencies, an exchange rate approximation based on, say, last month’s average is good enough. I don’t need to be precise to the last penny — I need to know whether I’m safe cash flow-wise. I’m not sure if I understand your question correctly. The answer is probably Yes. Cashflow FORECASTING is looking ahead into actual recorded Payables and Receivables, invoice by invoice, and calculating their difference by, say, week. Cashflow BUDGETING (1) is recording your ideas about future Payables and Receivables, by broad categories, grouped by, say, week. This is the traditional budgeting approach. Cashflow BUDGETING (2) is taking the stock of your actual cash ON HAND AS OF TODAY and allocating it to rather broad Payables categories by, say, week. This is the YNAB/PACE approach. Of them, number 3 is essential, number 1 is useful and number 2 is useless as it encourages pie-in-the-sky thinking. When we talk about cashflow forecasting here, what do we mean? At this time I’ve not had an opportunity to discuss this with other members of our team. Provisionally I would say that our cash flow forecast would take the current cash position and extrapolate forward using intervals of 30, 60 and 90 days (plus a custom period). The following totals will then be factored in. Open sales invoices falling due within the allocated period. Open purchase invoices falling due within the allocated period. The above is relatively easy to deduce. A big grey area is how we then factor in non-invoiced items that will affect the cash position of the business, e.g. loan repayments, credit cards, net wages, tax etc. Right now I’m not sure how we’d do this without a lot of manual adjustments. There could be a way for the user to just manually enter payment schedules (both one-time and recurring) for non-invoiced items. But that can be included in version 2. I’ve found Vistr, which is a cashflow forecasting add-on to Xero.com. It can be a source of inspiration. Maybe building an integration with an external service is a better option than developing your own advanced solution…?